Flushing bags come in 5 sizes depending upon your horse power rating and use. The flushing bag can be used to test if your cooling system is working prior to leaving home and launching. The flushing bag will circulate water using the engines water pump. You can also use this technique to watch for the thermostat to open when the engine warms up. Flushing bags eliminate engine noise present when using "clip on" flushing systems because the exhaust is under water. If the bag slips off, and you loose your cooling water source to the engine, the exhaust noise acts like an alarm attracting your attention. No more burnt up engines because the "clip on" system fell off. Using high water pressure from a garden hose has the potential to damage your head gasket prior to opening the thermostat. The flushing bag uses the engine water pump to circulate the water and reduces pressure on the head gaskets. Flushing bags come complete with hose fittings and can be used as a live bait bag. 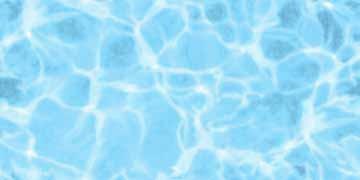 Sits on the swim step and is tied to stern rail. Just add a pump and you have circulating water to keep live bait longer. Can be used with salt or fresh water. Small flushing bags permit you to have the engine in gear with the prop turning and it does not affect the bag. 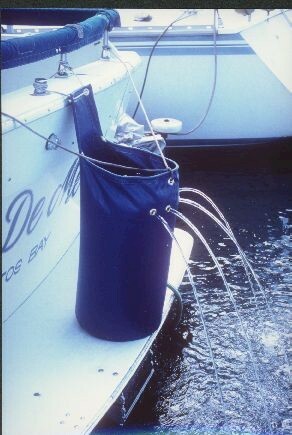 Larger engines tend to throw the water out too fast and the water hose can not keep the bag filled. Large engines should be kept in neutral. Flushing bags tend to last forever and Quality Marine Products provides a Lifetime Guarantee with each bag. They fold up small and store most anywhere. We feel this is obvious, but some customers have complained that the bags leak water. Flushing bags are designed to be used where water spillage is expected. These bags are not drip free and you can expect water to seep out the seams. The aerospace industry uses salt spray to accelerate corrosion and ageing in their product testing. A salt environment is the worst thing your your engine can experience as it significantly shortens the life span of your engine. Flushing your engine with fresh water after use will increase the life of your engine more than 20 years and save you hundreds of dollars in maintenance. Use your back button to return to your last page.